Happy 150th birthday, Archaeopteryx…you’re not a bird after all! Maybe. I’m an unabashed archaeopterygophile. When I’m in the presence of these famous fossils, the sense of history and significance is palpable. So, when it occurred to me that 2011 marks the 150th anniversary of the discovery and naming of Archaeopteryx, I blogged here about sesquicentennial activities. Meanwhile, I was quietly reviewing an article for the venerable science weekly Nature that, if correct, would suggest that Archaeopteryx might not be a bird at all. Today, the article by Xu Xing and colleagues appears, and I was asked to write the News & Views commentary that appears in the same issue. 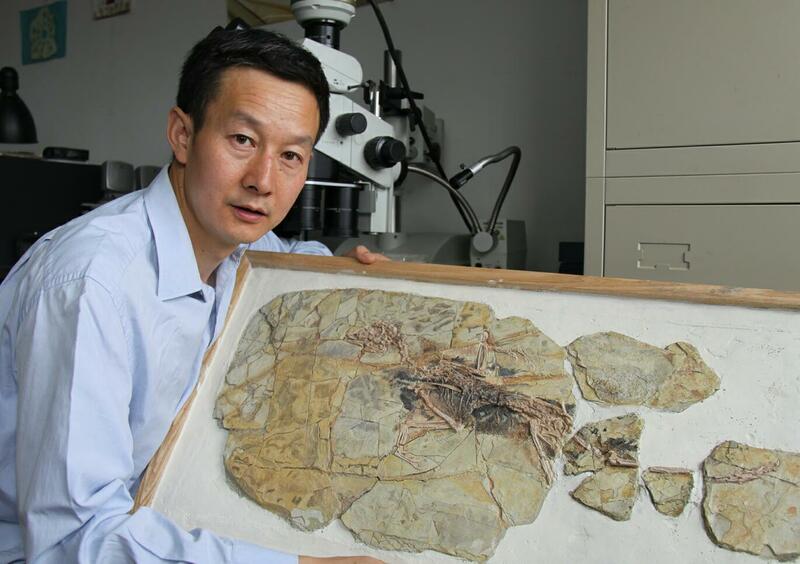 Xu and colleagues report on the discovery of a new species from the Jurassic of Liaoning, China, named Xiaotingia zhengi. Their analysis suggests not only that Xiaotingia is an archaeopterygid, but that archaeopterygids are outside Avialae, the lineage of true birds. The bottom line: Archaeopteryx isn’t a bird! Really? How is that possible and what are the consequences? Image from Witmer's News & Views commentary from Nature, showing the phylogenetic relationships of the relevant groups. We don’t know much about Xiaotingia at this point. It’s based on a single specimen that isn’t all that well preserved but has enough information to yield the phylogenetic results reported by Xu and colleagues. These results aren’t exactly rock-solid, as the authors themselves point out, and new finds or alternate interpretations could change the outcome. Archaeopteryx could again be an avialan. But that’s really what we should expect at this point. 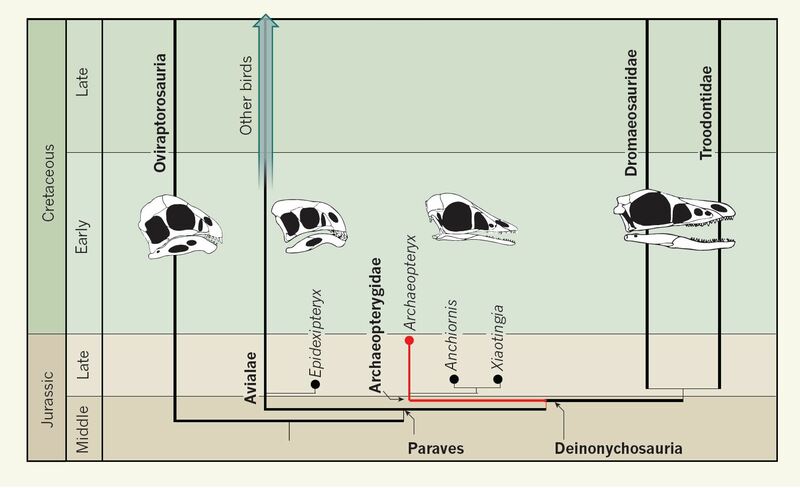 We’re getting very close to the origin of birds, dromaeosaurids, troodontids, oviraptorosaurs, etc. A prediction of evolution is that as we go back in time and approach a common ancestor, the species will become increasingly similar and the differences increasingly trifling. Fast forward to the late Cretaceous and we have very clearly demarcated groups, but, back in the Jurassic, they’re all pretty much the same. There was a massive amount of independent evolution (homoplasy) of various subtle traits, which is making it difficult for us to tease apart the knot of this evolutionary origin…but that’s how evolution works. Nobody said it would be pretty! To be honest, no one should be too surprised by all of this. Sure, for much of its 150 years, Archaeopteryx had all anyone needed to be a bird: feathers, wishbone (furcula), three-fingered hand, long arms, retroverted pubis, etc. Heck, feathers would have been enough. But in the past 15–20 years we’ve seen, one by one, the uniquely avian traits of Archaeopteryx to be shown to be neither unique nor avian. Most of these attributes are now known to be fairly widely distributed among theropod dinosaurs. As I said in my News & Views piece, it’s been good run for Archaeopteryx. First page of John Ostrom's landmark 1976 article. On a personal note, I'm proud to have known one of my inspirations, and this signed reprint is very special to me. 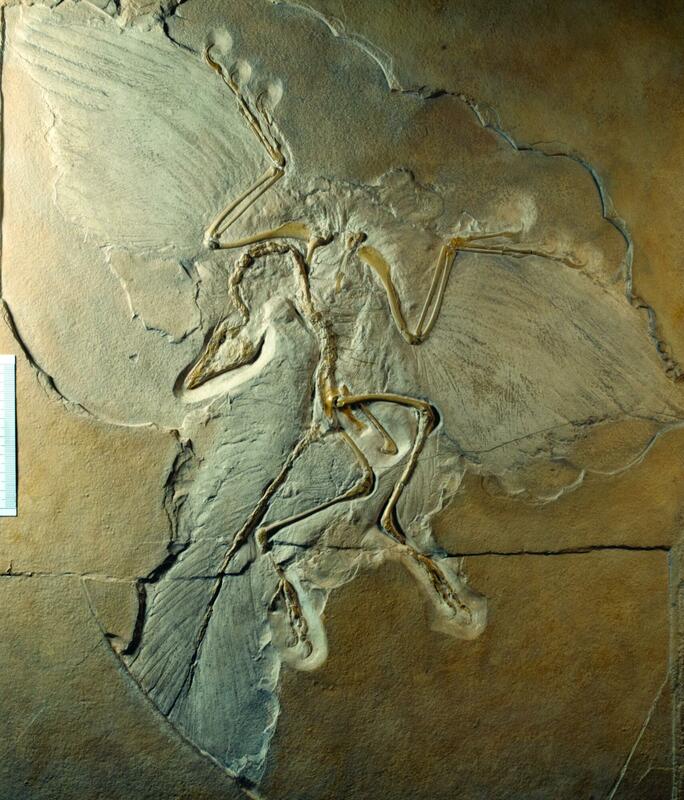 So Archaeopteryx wasn’t a bird…why is that a big deal? Moving archaeopterygids outside of birds, perhaps surprisingly, has no real impact on the origin of birds. Avialae is still the sister group of Deinonychosauria (Dromaeosauridae + Troodontidae), with Oviraptorosauria being a bit more distantly related. No news there. Party line. Scientifically, the big deal about moving Archaeopteryx out of Avialae is that it has the potential to change a lot about how we view the early evolution of birds. There are 150 years of accumulated scientific knowledge—hundreds (thousands?) of publications—about the beginnings of birds that is largely, if not exclusively, based on Archaeopteryx being the basalmost bird. 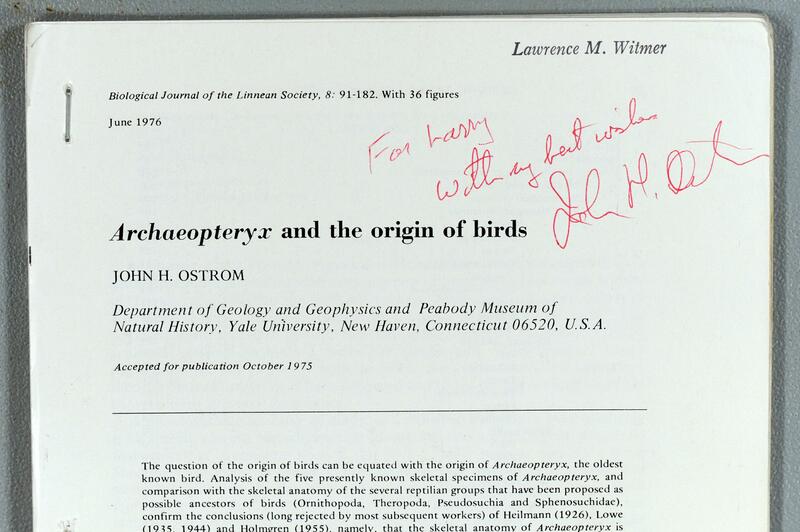 John Ostrom, the most important 20th-century worker on the origin of birds (and my academic great-grandfather: Witmer-Weishampel-Dodson-Ostrom), entitled his 1976 masterpiece “Archaeopteryx and the origin of birds,” and the very first sentence of the abstract was “The question of the origin of birds can be equated with the origin of Archaeopteryx, the oldest known bird.” That’s why the new Nature article is so important. Virtually all hypotheses about the early evolution of birds and flight have been filtered through Archaeopteryx. The question now becomes, how many of these hypotheses will stand? It’s probably wise not to get too attached to this idea of a nonavian Archaeopterygidae. Not yet anyway. It wouldn’t take much to get Archaeopteryx back into Avialae. The next new fossil could do it…or even a reanalysis of the Xu et al. data. But if we go on the assumption that our trusted and familiar friend Archaeopteryx, whom so many of us have studied firsthand many times, is no longer in its comforting position at the base of the avian tree, to which species do we look to guide our analyses of early bird evolution? According to most analyses, we’ll need to study such basal avialan upstarts as Epidexipteryx (a scansoriopterygid), Jeholornis,and Sapeornis—not exactly household names. Most basal avialans have been named in just the past ten years or so, and not much has been published. I was kind of amazed that Nature let me use the term “whining” in my News & Views piece, but really much of the lamentation about the current fate of Archaeopteryx is little more than whining. Tough luck, dude. Get over it. In reality, an Archaeopteryx-free Avialae opens up some pretty exciting new ideas. For example, Xu and colleagues and I both discussed in our Nature pieces the implications for the evolution of diet. Moreover, although the analysis of Xu and colleagues didn’t recover a close link between avialans and oviraptorosaurs, there are some remarkable similarities between these two groups. The collection of casts of Archaeopteryx specimens in the WitmerLab, with a mounted juvenile bald eagle for scale and as a reminder of the relationship under contention. We have casts of five of the ten or so specimens. Front row from left: Munich counterslab and slab (BSP 1999.I.50), Eichstätt slab and counterslab (JM 2257), and Solnhofen specimen (BMMS 500). Back row from left: London counterslab and slab (BMNH 37001), Berlin slab (HMN 1880/81). Peter Wellnhofer subtitled his recent masterpiece on Archaeopteryx “The Icon of Evolution.” Indeed, the beautiful specimens of Archaeopteryx have played pivotal roles in the history of not just studies of avian evolution but of evolution itself. As a seemingly perfect intermediate between reptiles and birds, Archaeopteryx has been a central document in the debates on evolution. Few fossils have had the sociological and political impact of Archaeopteryx. History can’t be changed, and hence Archaeopteryx’s place in history is secure. Although the creationist apologetics mill will no doubt seize on this shift of Archaeopteryx out of birds as showing the folly of evolutionists, they’ll be wrong to do so. This latest finding is a glorious affirmation of evolution in action, blurring the boundaries between different lineages within the tangled knot of an evolutionary origin. 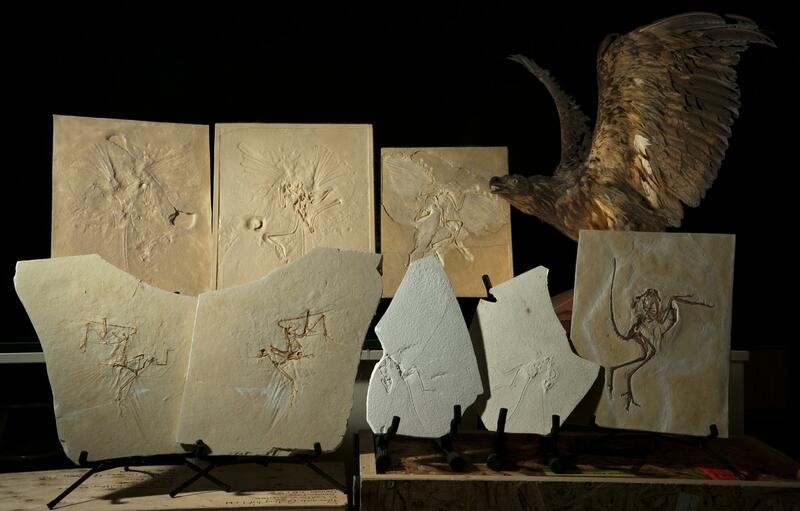 It’s only fitting that 150 years later, Archaeopteryx is back at center stage, still an icon of evolution. It’s a happy birthday indeed! Ostrom, J. H. 1976. Archaeopteryx and the origin of birds. Biol. J. Linn. Soc. 8:91–182. Witmer, L. M. 2011. An icon knocked from its perch. Nature 475:458–459. Xu, X., You H., Du K., and Han F. 2011. An Archaeopteryx-like theropod from China and the origin of Avialae. Nature 475:465–470. Why don’t you remember that many students of bird origin did not classifdied Archaeopteryx as a bird? (I don’t want to name them, of course you aware of all of them). At least this is unfair. Nikita, I didn’t name these dissenters in my blog post, but I certainly did in my News & Views for Nature. I’ll name names. Both Xu et al. and I acknowledged that Greg Paul has been saying this for years and we cited him. I also made reference to workers going back to the 1940s, referring specifically to Lowe. I’ve discussed this issue of historical dissent about the avian status of Archaeopteryx fairly extensively in publications in 1991 (http://bit.ly/po0kSP) and 2002 (http://bit.ly/q8BRrm). And there are more recent workers as well, but this idea hasn’t really had traction (for reasons that may well pertain more to sociology than paleontology). I didn’t mean to be unfair, and I don’t think I was, but I’m happy to square things here. Unless I glossed over it, Xu et al 2011 doesn’t talk too explicitly about what characters pulled Archaeopterygids over to Deinonychosaurs. In the supplement, it looks like there are about 56 characters that are both the same in (Archaeopteryx and Wellnhoferia) AND different for Xiaotingia zhengi. A decent number are from the head, and that’s pretty well smashed to bits! Thats a lot of time looking at tiny bones, I am surprised Dr. Xing isn’t wearing glasses in that photo above! Infact, I am glad the photographer was able to include some of that stereomicroscope behind Dr. Xing in the picture (and what a serious looking scope, with what looks like some serious glass for those objectives! Looks like it could be a zeiss, but with weird objectives for zeiss!). I guess you won’t be running X. zhengi’s head through a CAT scanner anytime soon with it in that many peices tho!